According to the IMF (International Monetary Fund), the global financial crisis will significantly worsen the budgetary position of many Low Income Countries (LIC) governments up to the level where they will need international aid to be able to survive the crisis. On one hand, government revenues are expected to suffer as economic activity slows and commodity prices fall. Potential declines in donor support and tighter financing conditions will likely impose further pressures on their budgets. On the other hand, many countries will need to increase spending to protect the poor, and additional spending pressures may arise from currency depreciation and rising interest rates, which could raise debt service costs. 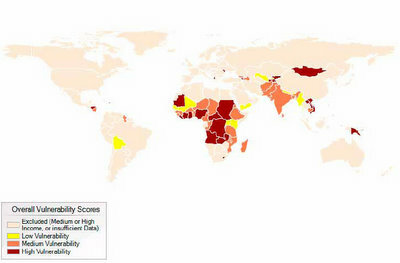 The most vulnerable countries are: Albania, Angola, Armenia, Burundi, Central African Rep., Congo DRC, Côte d'Ivoire, Djibouti, Ghana, Haiti, Honduras, Kyrgyzstan, Laos, Lesotho, Liberia, Mauritania, Moldova, Mongolia, Nigeria, Papua New Guinea, St. Lucia, St. Vincent & Grenadines, Sudan, Tajikistan, Vietnam and Zambia. The climate crisis combined with the financial crisis, results in a food crisis. Again, it's the world's poorest who are most affected.